As almost certainly William Shakespeare’s final play, The Tempest has always struck me as lovely in a wistful sort of way – and it did so even before I knew its presumed place among his works. Its central character, a displaced Italian duke now left with a remote island to rule and (not incidentally) a daughter to marry off, relies on what he memorably calls “this rough magic” to move people, places and events around. Perhaps as a ruler might. Definitely as a playwright does. The single largest act of interpretation here is setting the action on a real “island” formed of human disposable products, sometimes called “The Great Pacific Garbage Patch.” Still, if you fear somebody is hammering the Bard’s last words into a foreign shape to further the cause of environmentalism – as I initially feared – you needn’t. The Patch, in the end, is merely an interesting place to design a play. And since Classical Theatre Company is extremely faithful to the written text, the subject never actually comes up. Truth is, the Bible has far more environmentalism than the collected works of Shakespeare. 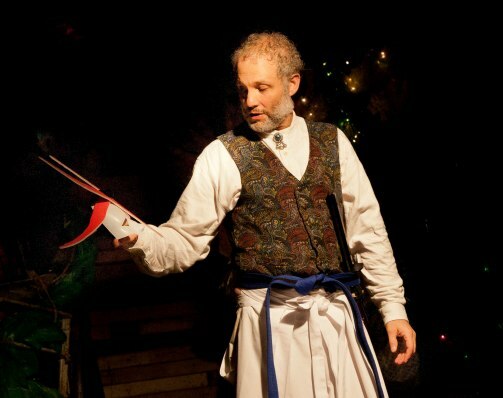 As Prospero, the Bard stand-in who rules the island with spells learned from his beloved books, Philip Lehl is remarkable. He brings credibility to a largely incredible situation and milks the basic human emotions here for all they’re worth: an old man struggling with bitterness over wrongs done in the past, a father wishing happiness for his daughter arriving at womanhood, and yes, a ruler/creator assessing what’s right and wrong about the twin acts of ruling and creating. Since the two women in the cast don’t even get to play women all the time, this is basically a Guy Show. Standouts in addition to Lehl include Kregg Dailey as the ever-slithering and snarling sub-human slave Caliban and Dylan Godwin in a wildly comic turn as drunken Stephano. Xzavien Hollins brings quite a presence to the role of conspiratorial Antonio (think of him as Iago Lite) and we certainly look forward to seeing this actor with more interesting things to do. As for the women, Jacqui Gray shimmers convincingly as Miranda, the daughter discovering her first love, and also embraces physical comedy as Trinculo, a zany shipwrecked sailor. As Ariel, the spirit who executes Prospero’s every wish on the promise he will set her free, Blair Knowles borrows moves from Chinese opera, martial arts, classical ballet and good old American cheerleading. It’s an odd, not always convincing way to be Ariel. Yet it sits comfortably enough within this heartfelt, thought-provoking but most of all entertaining farewell from one of history’s brightest theatrical lights. 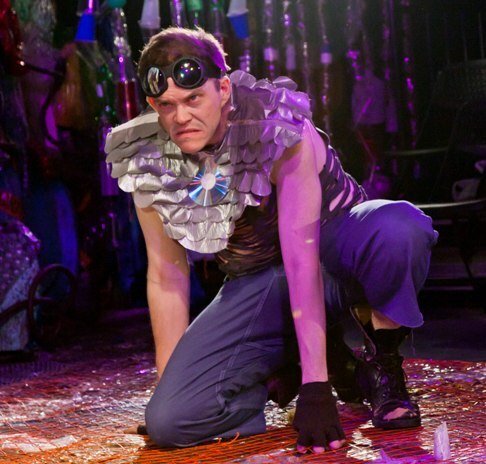 Photos by Jan Saenz: (top) Philip Lehl as Prospero; (bottom) Kregg Dailey as Caliban.